Bradford on Avon is a beautiful historic town on the edge of the Cotswolds. Home to the woollen industry of old it is the home of Eat Square. Yes this is our local market and we get many regulars here. Every Thursday you will find Eat Square at the council run market in the centre of Bradford-on-Avon. 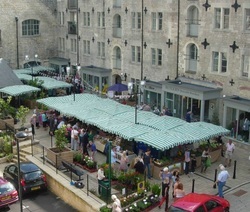 Conveniently located next to the library the market is well supported and offers fresh veg, fish, cheeses and much more. You will find us here on the last Sunday of every month at the Wiltshire Farmers Market. Being our home market we normally sell out quickly so it's advisable to reserve your pies in advance. Just send us a message ahead of time to book your selection.